Yes! I Green Monster every morning!! I have been going through a MAJOR cleanse since I first visited France, 7 years ago. After observing the raw real ways of the French. It all started started with my house, then to my food, then to my relationships. The Green Monster has entered my body, mind & soul. celery, spinach, parsley, cucumber, kake, romanin, wheat grass & sunflower leaves!! Oh Sande I must try this. I am eating healthier , not losing any weight though. Just one size is needed as I cannot get into an entire wardrobe! Have to admit, the before photo looks, er, better than the after. So I'm glad you gave us the heads up that it still tastes great. And to French Blue.... I was intrigued that your major cleanse has now included every area of your life. I'm keeping that in mind! I should be doing it, but i haven't tried it yet - such a chicken!! I'm a huge fan of these, and this recipe in particular looks fantastic! I find it easy to get all my fruits in the summertime, with all these amazing berries in season. Today has been a big blueberry and wild blackberry day. Cheers to you for doing green monsters every day! You must be feeling so healthy! Thanks for the reminder great quick meal and great to take on the road. It's a great way to stay healthy. Cheers! I make a Glowing Green Smoothie each morning which is very similar. I thought giving up my morning coffee would be difficult but I don't miss it one bit. Oh gosh Sande, really it tastes okay! I must give it a go if you recommend it. 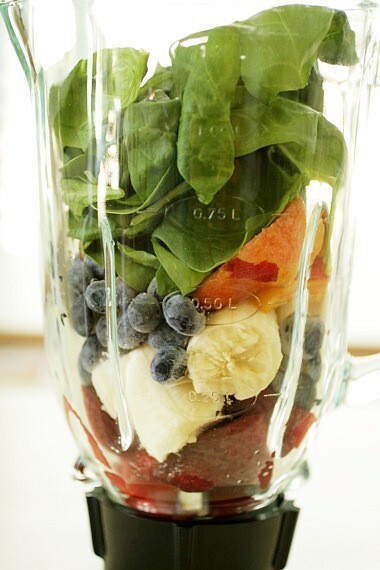 It would be great to get all the fruit and spinach done in one go. Have not tried it, but plan to! Thanks for your attempt at injecting healthy substances into my body... I do not naturally reach for them.. but this makes them look so lovely and delicious! Don't miss my current inspired home post... a must see full of exquisite collections! OK I guess I'm out of the loop because I didn't know about Green Monsters. Looks and sounds delicious however!! And I love your new Objects of Desire - both the concept and this particular pick!! I am soooo trying this.....thank you!